To determine the navigability of Arizona's 39,039 watercourses as of statehood, February 14, 1912. The purpose for doing this is to determine streambed title/land ownership of the beds of rivers and streams. ANSAC HEARINGS and ADJUDICATIONS include all Arizona Watercourses except the Colorado River. To determine the Public Trust Value of any Arizona watercourse or reach or segment of any watercourse that through the ANSAC adjudication and court processes is determined to have been navigable at time of statehood, February 14, 1912. The Arizona Navigable Stream Commission is a General Fund single budget program commission. The Commissions first responsibility is to determine which Arizona Rivers and streams were navigable at time of Statehood, February 14, 1912, and which were non-navigable. ANSAC accomplishes this by holding watercourse evidentiary navigability hearings. This includes using hydrologists and other engineers to conduct "particularized studies" regarding issues that affect navigability. Navigability determinations are necessary for deciding who owns a streambed, that is the land beneath the stream or river. The ANSAC adjudication process is essential for determining whether land beneath rivers and streams are subject to ownership by the government or by the person whose land a particular river or stream crosses. Determining ownership is further necessary to help clear more than an estimated 100,000 "clouded" property titles where streambed ownership is unknown. 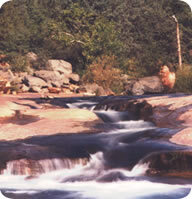 To accomplish this, ANSAC has held more than 160 watercourse navigability hearings, with some hearings including as many as eight days of witness testimony .Some witnesses were Arizona citizens including Arizona Legislators, and most witnesses were professionals in areas such as hydrology, history, fluvial geomorphology, geology, and marine-archeology. ANSAC has also received thousands of pages of documents-that make up altogether more than 50 bankers' boxes as evidence. This includes 27 boxes of documents for the recent round of hearings related to only five rivers. If a river was navigable at time of statehood, then title to the streambed is subject to ownership by the government. If a river was non-navigable at time of statehood, then title to the streambed is subject to ownership by the person whose land the river crosses. The future of ANSAC depends on one thing; whether appeals are filed regarding any of the five river reports the Commission ratified on June 28, 2018. The deadline for filing appeals in Superior Court is approximately March 29, 2019. Superior Court. The deadline for filing appeals in Superior Court is approximately March 29, 2019. ANSAC may consider requesting an additional four years beyond the current Sunset date if any appeals are filed, because of the time necessary for going through the court process. The Commission ratified all five remaining reports for the Gila, Salt, San Pedro, Santa Cruz, and Verde Rivers on June 28, 2018, including determinations that each river was non-navigable at time of Statehood, February 14, 1912. If no one appeals any of ANSAC's determinations in Superior Court then ANSAC plans to Sunset on June 30, 2020. Again, the deadline for filing appeals is approximately March 29, 2019. Relating to appeals, ANSAC may file its own legal actions if necessary. In the event courts rule specific watercourses or portions of watercourses were navigable at time of statehood; there is a statutory requirement that ANSAC hold proceedings to determine the Public Trust Value of such watercourses or portions of watercourses. Once all reports have been through the ANSAC hearings process and through the court processes, and all casework is completed, then ANSAC, through its attorneys, will record all reports in each county through which each river travels. Funding for outside legal counsel and related expenses. Pursuant to A.R.S. §37-1122.B, ANSAC is required to use outside legal counsel. Funds may be necessary for outside legal counsel/attorney costs for all commission legal work and related expenses including defense of appeals filed in Superior court and filing legal actions on behalf of the Commission. Funding for any additional equipment including computers to complete the Commission’s work and to complete the ANSAC website. The Commission has determined all five remaining rivers were non-navigable at time of Statehood, February 14, 1912, and the beds are therefore subject to ownership by the person whose land the waterway crosses. In the event anyone appeals a Commission determination, the Commission will consider any directives issued by the Court regarding any or all five of the remaining cases. If someone files an appeal and if the courts uphold ANSAC’s determinations, then ANSAC will begin the Sunset process. If through the appeals process a court rules a river, reach, or segment of a river was navigable at time of Statehood then the Commission will hold Public Trust Value Hearings to determine value. If, during the appeal process, a court determines a river or portion of a river was navigable at time of statehood then ANSAC will request additional time beyond the current Sunset Date of June 30, 2020. ANSAC will need to determine how much time, in terms of added years, may be necessary for additional studies and hearings to determine the Public Trust Value of the land beneath the river or portion of a river that a court determines was navigable. Completion of all casework will allow ANSAC to complete the Sunset process and close its doors. ANSAC does NOT deal with Water Rights, Water Use, Water Ownership, or Water Diversion Issues and Deals only with matters relating to Land Title to the Beds of Arizona's 39,039 Rivers and Streams. The official source of dates, times and locations of hearings or other ANSAC meetings is on the kiosks in the lobbies of the Arizona Senate and House. Additionally, all notices of state agency, board, or commission meetings is online under State of Arizona, "Arizona Public Meetings Notices" or by using other similar text to find the ADOA official public meeting notices site. Normal Business Hours are weekdays except holidays 8:00-5:00. When we are away from the office, we try to forward the office phone to a phone someone will answer or to a phone where a caller may record a message. We ask that visitors make an appointment to review hard-copy original evidence for two reasons. 1. So we can have the (sometimes several) boxes of evidence the visitor will need ready and, 2. So two parties who want to review the same evidence but who are on opposite sides of the issue do not visit the office at the same time. This has occurred a few times and our space for reviewing evidence is limited. When ANSAC completes its work, it will Sunset or go out of business. The present Sunset Date is June 30, 2020; however, the Commission plans to complete it work before that date. PURPOSE: To help clear more than 100,000-clouded Arizona property titles to the land beneath Arizona's 39,039 rivers and streams. As mentioned earlier, ANSAC's work pertains only to land beneath rivers and streams and not to water issues such as ownership, use, or diversion of water. There are many existing laws that deal with water ownership and use matters. ANSAC does not hold hearings to determine the navigability of the Colorado River because the Federal Government owns the Colorado. HOW: By gathering evidence, including testimony and engineering studies, and holding evidentiary navigability hearings on all of Arizona's 39,039 watercourses. ANSAC holds hearings in each of Arizona's 15 counties to provide an opportunity for the public to participate. The reason for evidentiary hearings including testimony by Arizona Citizens and Professionals to determine which Arizona Rivers and streams were navigable and which were non-navigable at time of statehood of February 14, 1912. If a Watercourse was NAVIGABLE at statehood then the bed/the land beneath the watercourse is subject to government ownership. If a Watercourse was NON-NAVIGABLE at statehood then the bed/the land beneath the watercourse is subject to private ownership by the party whose land it crosses.